Like most professions, geotechnical engineering has benefited immensely from the personal computer revolution. Today, better computing capability allows engineers to accurately calculate in seconds what used to take days to complete. As the profession evolves to take advantage of these advancements, we are limited only by our ability to imagine the ways in which we can apply computing technology to answer the difficult questions that arise when structure meets soil. Now, that semi-infinite, homogeneous, isotropic half-space our professors taught us to consider for purposes of simplicity can be tossed to the side to allow numerical modeling calculations to pound out the results of any variation that we choose to add to the model. But a danger lurks beneath. 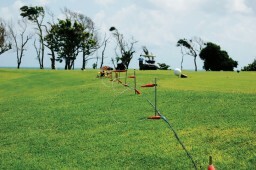 Calculations are only as reliable as the site characterization work that was performed. Site characterization precedes geotechnical engineering, analysis, and design and allows us to better understand the site, its soil, rock (if present), and groundwater conditions. We must understand the soil and rock properties to a degree of accuracy and precision that is compatible with the numerical analyses that will be performed. Consider the standard penetration test. This is a time-honored way of determining foundation capacities and settlements by lifting a 140-pound hammer 30 inches and dropping it on steel drill rods to pound a sampler into the soil. As we drop the hammer, we count the number of times that it takes the sampler to penetrate the soil for 18 inches, and record that as the “blow count” or the “N value” of the stratum being sampled; tap tap tap. This testing methodology has stood the test of time, but it is not sufficient to provide adequate input to the complex analytical tools now available to predict soil-structure interaction. The advance of computing methods begs for better ways to characterize the subsurface. 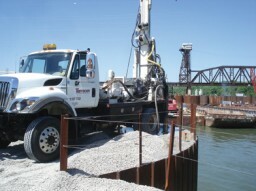 Terracon offers site characterization services as a fundamental part of its geotechnical engineering service line. With an understanding that proper site characterization is essential at the start of a geotechnical engineering project, Terracon offers site characterization capabilities that range from standard sampling and testing methods such as Standard Penetration Testing or Shelby Tube sampling to in-situ testing, geophysical testing, advanced soil laboratory testing, and GIS-based data evaluation systems. Terracon serves the needs of a diverse client base comprised of firms with discerning engineers who know that, regardless of the quality of the analysis, the design is only as good as the data collected in the field and in the laboratory. For example, Arcadis recently retained Terracon to perform site characterization services for the Williston Levee in North Dakota. This project entailed the performance of 45 soil borings and associated laboratory testing under the direction of Arcadis’ geotechnical engineering staff, the conduct of electromagnetic resistivity imaging over a six-mile area, and the performance of more than 5,000 lineal feet of Cone Penetrometer Testing. Terracon also installed 14 piezometers and performed pump tests in selected wells. This data provided essential knowledge of the subsurface, enabling Arcadis to perform the proper calculations to understand the safety of the existing levee system and to design mitigation features where the analyses indicated the need. Site characterization is an essential part of baseline data reports for design-build projects. Terracon worked with HNTB Corporation for the Lenexa, Kansas Gateway I-35/I-435/K-10 Intersection to develop such a baseline data report. This was an extensive soil exploration and laboratory testing project that developed the site characterization necessary to allow subsequent design-build proposals. Our clients have come to depend on Terracon for the difficult tasks associated with collection of these critical field and laboratory data. Such data, and associated evaluations and interpretations to knit these data together, comprise the site characterization that precedes the geotechnical engineering, analyses, and design. There is no question that the net effect of sophisticated computing power applied to theoretical geomechanics problems can render a better and more cost-effective design for geotechnical engineering endeavors. This applies to foundations, dams, levees, and pavement grade separation structures, as well as a myriad of environmental applications. However, these advancements are not worth the cost of powering the computers without the critical work that takes place in the field. That is where Terracon’s site characterization services come in. Our skilled and experienced professionals are prepared to provide that essential start to your next geotechnical engineering project.